Have you started your Christmas shopping yet? Now that Thanksgiving is over, a lot of people are kicking their Christmas preparations into high gear. I thought I would share a few of my favorite gift ideas from Stampin' Up! with you. Take a look - you might find something perfect for someone on your list this year! You can choose 1-month, 3-month, 6-month, or 12-month. Purchase a prepaid subscription and you will be emailed a code which you can then share in a fun card (or even an e-card!) with the recipient. If you purchase a 12-month subscription, you even get some hostess benefits, which equals some free stuff for yourself! This is a great gift for anyone on your list who likes crafty little projects, even kids or teens! 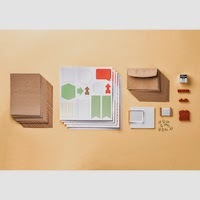 This kit comes with everything you need to put together 20 greeting cards. Make sure to purchase SNAIL adhesive to make putting them together even easier. Everyone needs an easy greeting card now and then - this gift is for anyone! 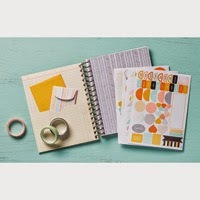 If your gift budget is a little lower, this card kit also makes 20 cards, for $10 less! A little SNAIL adhesive completes this gift as well, and the recipient will have lots of fun putting the cards together! The Online Extravaganza is Here! I am so excited for this sale! Stampin' Up! really has some great deals this week! Click here to see all the deals. The sale runs now through December 2, with doorbuster deals today and next Monday, December 1. I am also doing something special during this sale! Place an order anytime during the sale using the hostess code 6EERH3SD and you will be entered into a drawing for a free hostess stamp set! Don't forget - there is also a join promotion going on right now! Join Stampin' Up! for only $75! You get to pick $125 worth of product, and you can choose sale items to make your money stretch even farther! Plus, if you join during this promotion (now through December 2), you will earn an extra 5% back on anything you buy or sell during the month of December. Awesome, right?!? Visit my business website and click the Join the Fun button to sign up. Some Exciting Days Coming Up! Stampin' Up! has two exciting promotions coming up next week! Both of these promotions will run from November 24 - December 2. The best part - you can double dip and take advantage of BOTH promotions! First comes the Online Extravaganza Sale! It's like a Black Friday sale, but for a whole week! There will be special doorbuster deals on the first and last days of the sale, and lots of other things on sale all week. Click here on Monday to visit my online store and see all of the great deals! The second promotion is a sale on the Starter Kit. For one week, the starter kit will be available for 25% off (around $75 instead of $99). You still get to pick $125 worth of products AND you can even pick products that are on sale in the Online Extravaganza! Plus, anyone who signs up during this week will get an extra 5% back on their December sales. Awesome, right?!? I'd love to have you join my team! You'll be getting a great deal this week if you do, even if you just want a good deal on some of your favorite Stampin' Up! products. Visit my business website and click on the Join the Fun button to take advantage of this amazing deal! Have a great weekend! I'm hosting a Stamp Camp tomorrow, and next week I'll be sharing a few projects from that. Yesterday, my sweet little niece, Elizabeth, was born! Today I'm sharing the card I made to send my sister's family to celebrate her birth. I get to meet her next month, and I can't wait! I used one of the cards from the Project Life Little Moments card kit. It made putting this card together really quick and easy! I drew my color scheme from the colors in the card kit. The greeting from Big News was a perfect fit! I've been wanting to try this easy idea for a long time, and since I had my Aquapainters out for Christmas cards already, I decided that today was the day. Simply use the Aquapainter to paint a layer of color on Watercolor Paper, let dry, and stamp thank you in the same color. In the end, I think I would have liked another color better. The watercolor layer of Blackberry Bliss turned out too 'pink' for my liking, but it wasn't horrible enough to throw out. Next time I think I'll try Coastal Cabana. That's the color pictured using this technique in the catalog, and it's another one of my favorites. Live and learn. Have you tried out Stampin' Up! 's fringe scissors yet? I received a pair as an incentive about a month ago, and I finally tried them out on this card. I'm sorry, more Christmas today. Actually, I'm not too sorry. I love Christmas! I made up a few of these cards for a team swap this afternoon, and I love how they turned out! If you are looking for an easy Christmas card to make this year, this is it! It's simple and quick, but very pretty. A little sparkle makes any card beautiful! I plan to make a quick video showing how easy this card is. I'm not sure how soon I'll get it done, but watch for that in the next week or so. Then visit my online store to shop for supplies to make your own! 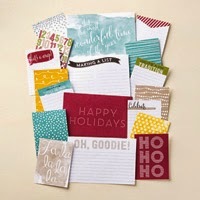 You can get your Christmas cards done and ready to send before Thanksgiving this year! If you choose to make this card, you'll also need a clear block (I used C, which should work for all of the stamps in this set), and SNAIL adhesive. I used a little bit of Scotch tape on the back to hold the ribbon in place. 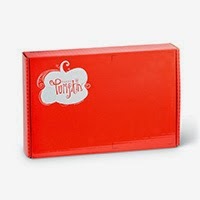 Whisper White card base: 5 1/2" X 8 1/2"
Real Red layer: 5 1/4" X 4"
Whisper White stamped layer: 5 1/8" X 3 7/8"
Silver Glimmer: 5 1/8" X 5/8"
I love that there is a Project Life item on there this week! Make sure to take advantage of that! I know, I know, Thanksgiving is not even here yet, and I have a Christmas project to share today. I do not plan to skip over Thanksgiving, but I absolutely love Christmas! And in all honesty, I am starting to get a lot of things ready for Christmas this month. We will be traveling, and some of the gifts have to be given out early, plus I am committed to getting my Christmas cards out early in December this year! I wasn't going to share today's project with you quite yet, but I was so excited with how it turned out that I changed my mind. I created an ornament using the November 2013 Paper Pumpkin kit. Last month, Stampin' Up! offered demonstrators the opportunity to purchase a 'party pack' of this kit, with the kit itself plus 3 refill kits. They also shared some great alternate ideas for the kit, and I loved the ornament that was shown. So here is my spin on it! And yes, it is very hard to take a picture of something clear with no glare or reflection. Any tips from photographers out there? These were my two best attempts out of about ten pictures. This ornament will be one of the projects at my upcoming Stamp Camp on November 22. If you'd like more details about that event, please visit my business website and scroll to the bottom for my calendar of events. Are you busy working on Christmas projects yet? Leave a comment and let me know what projects are on your list! Here are this week's deals... I of course just bought the triangle punch a few weeks ago. If you don't have it yet, now you can get it on sale! I hope you all had a happy and safe Halloween weekend! We had a Jack-o-lantern pizza from Papa Murphy's, and caramel apples for dessert on Halloween evening. My in-laws had dinner with us, and then we got the kids into costumes. My daughter was a giraffe, and my son was Tigger. The costumes were adorable, and warm enough for a cool night of trick-or-treating. Last year it was really cold and rainy, so we enjoyed the clear night with just a little chill in the air. The kids loved trick-or-treating, and they really hauled in the candy! Watching their excitement was the real treat for me. My daughter kept asking for more trick-or-treating after each house we stopped at, in between looking up at the sky and saying, "I see moon!" and running up and down the sidewalk. Many priceless memories that I will remember for a long time. Now that Halloween is over, it's time to start planning and decorating for the next holiday, Thanksgiving. Today's project is certainly fitting for that! Take a look at this little turkey, created out of the Curvy Keepsake Box! Isn't he cute? I got the idea for him here. It's a little time-consuming to cut all of his parts, but the Big Shot and an assortment of punches make the task pretty easy. Do you recognize that stamp? It's from the October Paper Pumpkin kit! I didn't think I had any appropriate Thanksgiving stamps that would be small enough, but then I remembered this one. It was perfect! The Curvy Keepsake Box is so versatile. Look it up on Pinterest, and you'll see what I mean. I am going to keep creating with it, and I'll share the projects I come up with on here.